Welcome to Arab Elementary School Principal: Mike Shipp Assistant Principal: Denise Porch Address: 241 8 th Ave. Phone: 586-6085. 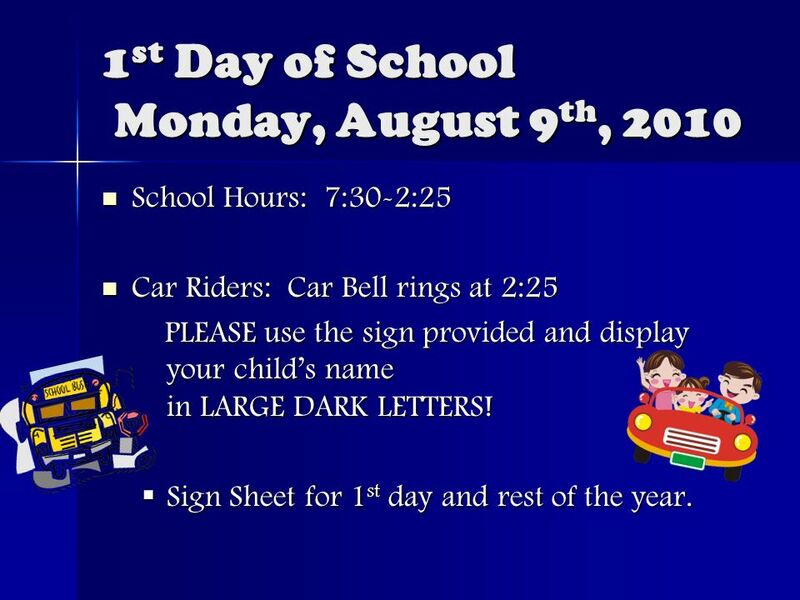 2 1 st Day of School Monday, August 9 th, 2010 School Hours: 7:30-2:25 School Hours: 7:30-2:25 Car Riders: Car Bell rings at 2:25 Car Riders: Car Bell rings at 2:25 PLEASE use the sign provided and display your childs name in LARGE DARK LETTERS! PLEASE use the sign provided and display your childs name in LARGE DARK LETTERS! Sign Sheet for 1 st day and rest of the year. Sign Sheet for 1 st day and rest of the year. 6 $25.00 covers the cost of reading workbooks, Time For Kids, $25.00 covers the cost of reading workbooks, Time For Kids, take-home binders and daily planners take-home binders and daily planners STI Home is available for a cost of $5.00 per child. STI Home is available for a cost of $5.00 per child. Any donations to offset the cost of these times are appreciated. Make checks Any donations to offset the cost of these times are appreciated. Make checks payable to Arab Elementary School. payable to Arab Elementary School. 7 STI Home STI Home is a program that allows you to monitor your childs grades using your home computer. STI Home is a program that allows you to monitor your childs grades using your home computer. Each student is assigned a password that allows you to view individual scores. Each student is assigned a password that allows you to view individual scores. 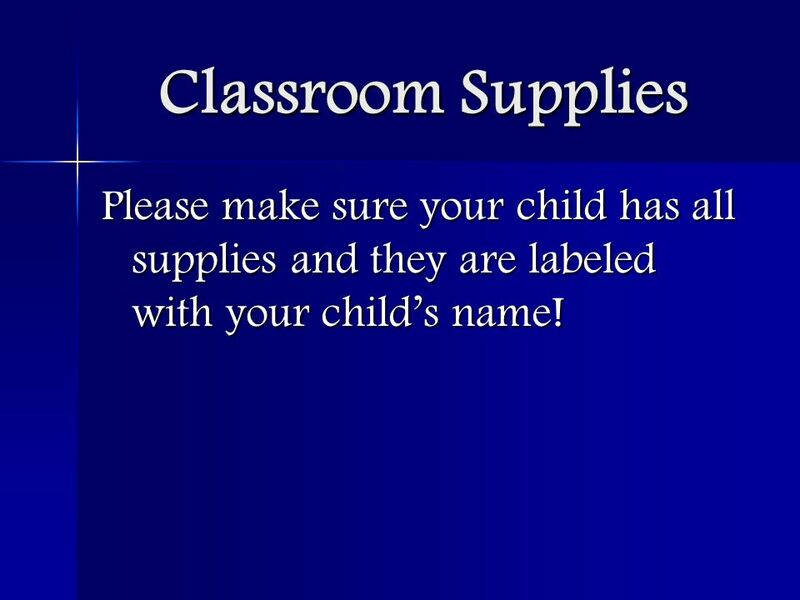 10 Classroom Supplies Please make sure your child has all supplies and they are labeled with your childs name! 11 Take-Home Binders/Planners Assignments will be written on a planner board in the classroom and your child will be responsible for writing these assignments in his/her planner. Assignments will be written on a planner board in the classroom and your child will be responsible for writing these assignments in his/her planner. This binder will include homework as well as any other school correspondence. 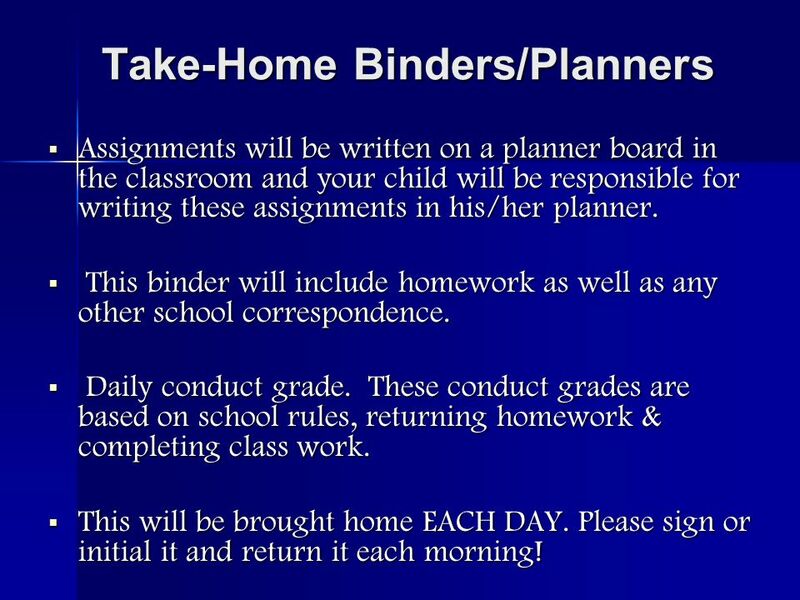 This binder will include homework as well as any other school correspondence. Daily conduct grade. 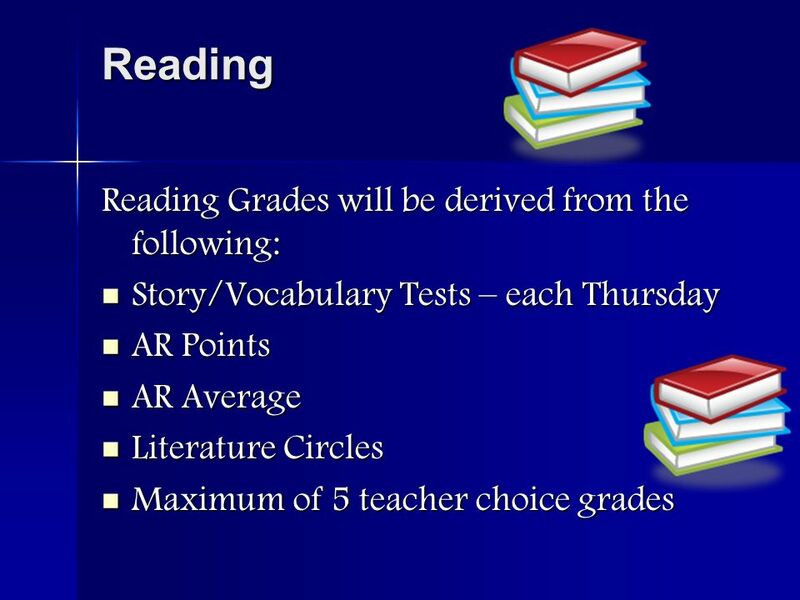 These conduct grades are based on school rules, returning homework & completing class work. Daily conduct grade. 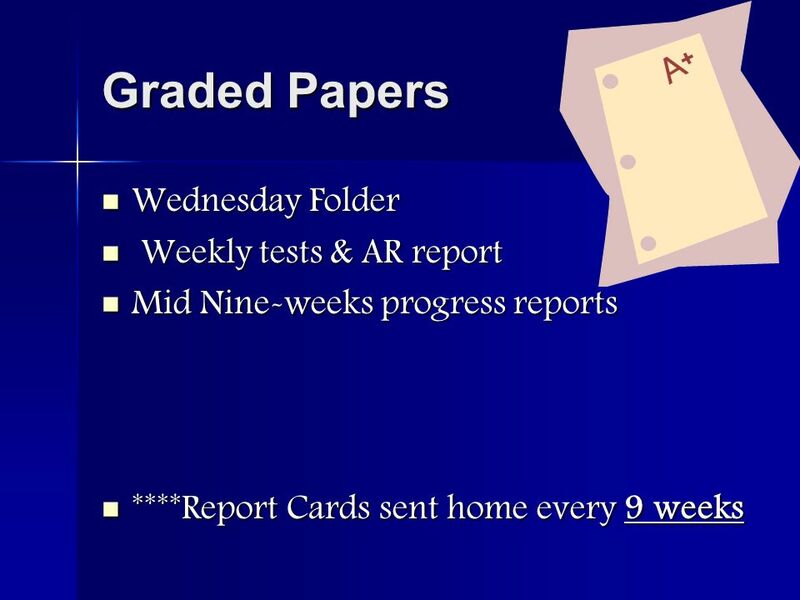 These conduct grades are based on school rules, returning homework & completing class work. This will be brought home EACH DAY. Please sign or initial it and return it each morning! This will be brought home EACH DAY. Please sign or initial it and return it each morning! 13 Lunch The daily cost of a student lunch is $2.00 ($10.00 weekly). 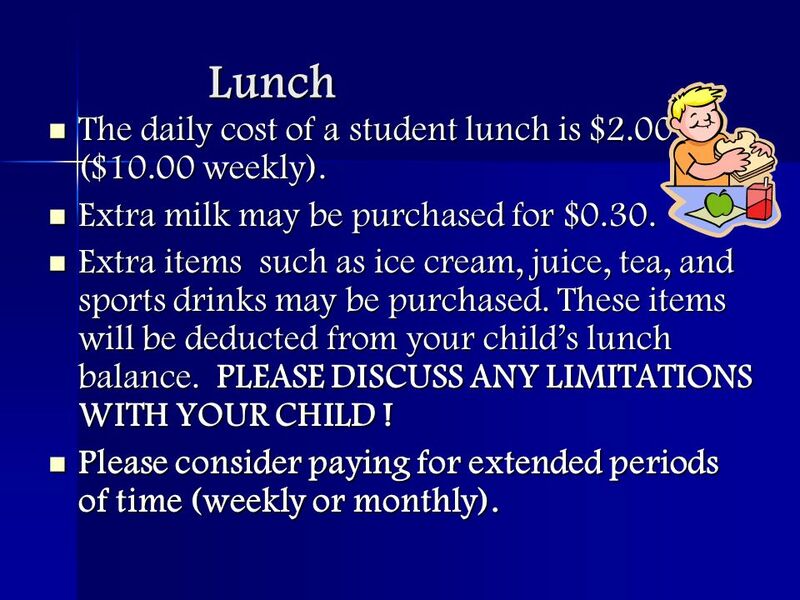 The daily cost of a student lunch is $2.00 ($10.00 weekly). Extra milk may be purchased for $0.30. Extra milk may be purchased for $0.30. Extra items such as ice cream, juice, tea, and sports drinks may be purchased. These items will be deducted from your childs lunch balance. PLEASE DISCUSS ANY LIMITATIONS WITH YOUR CHILD ! Extra items such as ice cream, juice, tea, and sports drinks may be purchased. These items will be deducted from your childs lunch balance. PLEASE DISCUSS ANY LIMITATIONS WITH YOUR CHILD ! Please consider paying for extended periods of time (weekly or monthly). Please consider paying for extended periods of time (weekly or monthly). 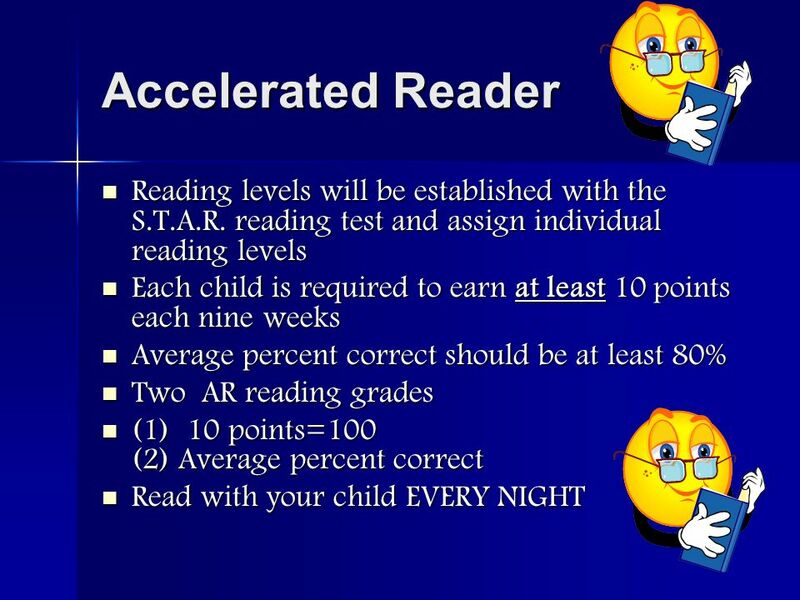 16 Language Language skills will be covered weekly that coordinate with the reading selection. 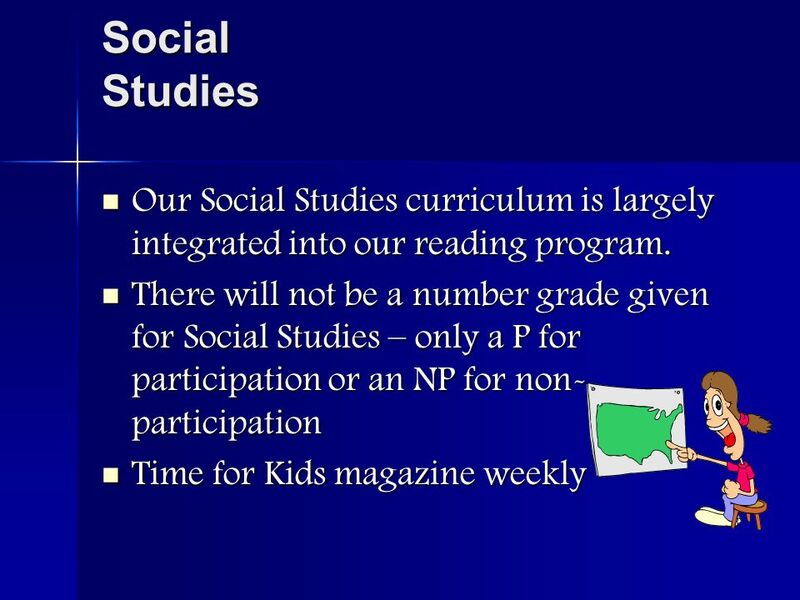 Language skills will be covered weekly that coordinate with the reading selection. 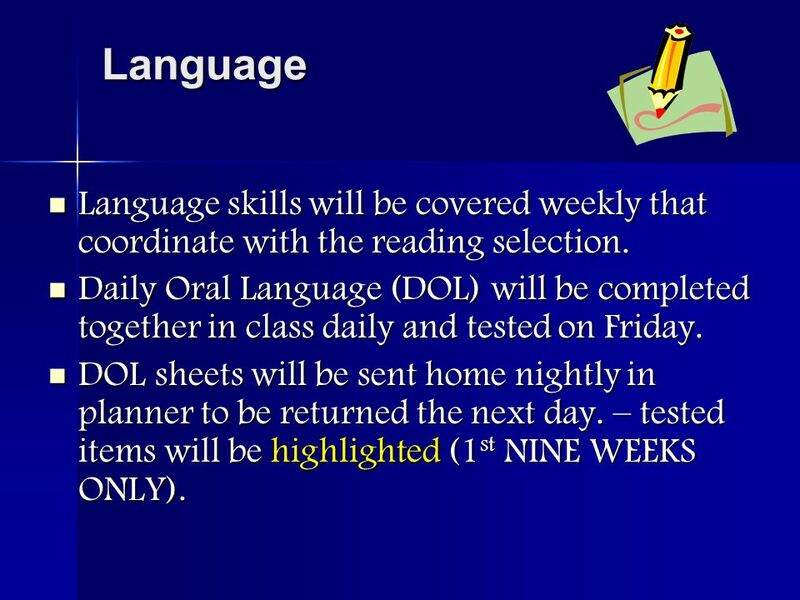 Daily Oral Language (DOL) will be completed together in class daily and tested on Friday. 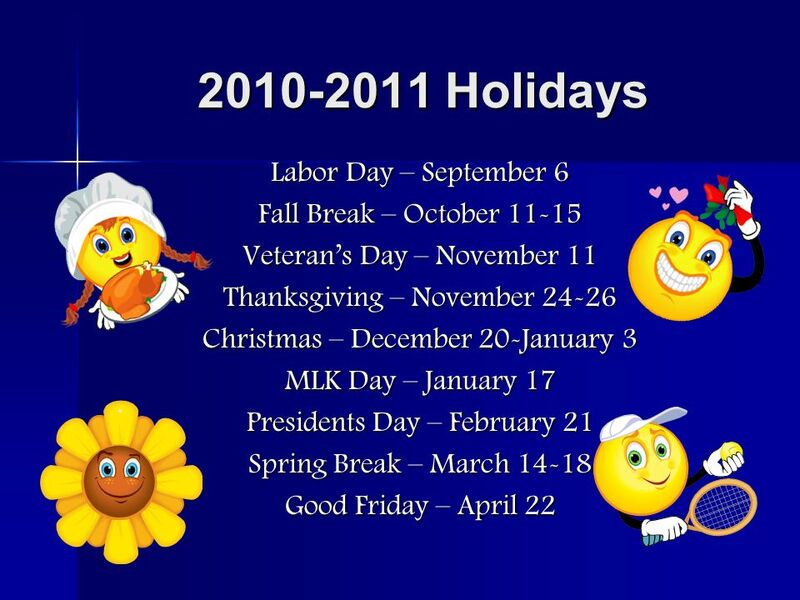 Daily Oral Language (DOL) will be completed together in class daily and tested on Friday. DOL sheets will be sent home nightly in planner to be returned the next day. – tested items will be highlighted (1 st NINE WEEKS ONLY). DOL sheets will be sent home nightly in planner to be returned the next day. – tested items will be highlighted (1 st NINE WEEKS ONLY). 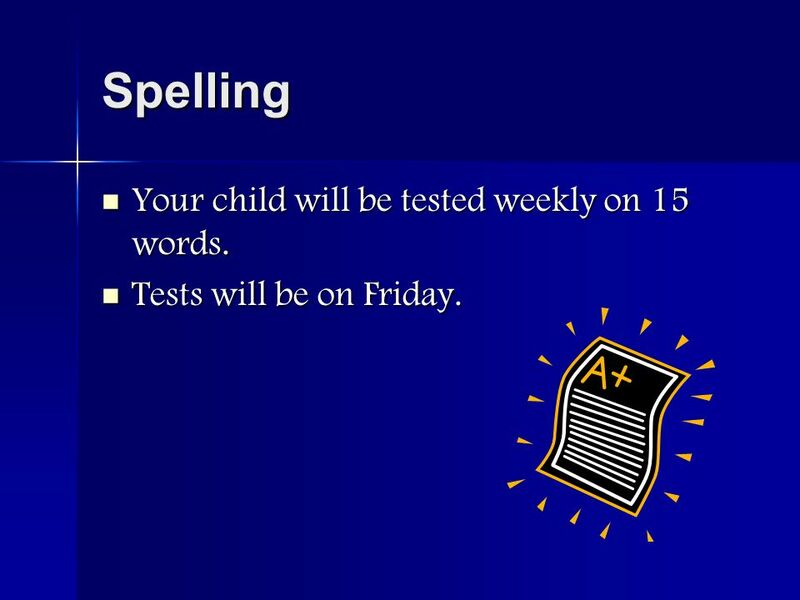 17 Spelling Your child will be tested weekly on 15 words. Your child will be tested weekly on 15 words. Tests will be on Friday. Tests will be on Friday. 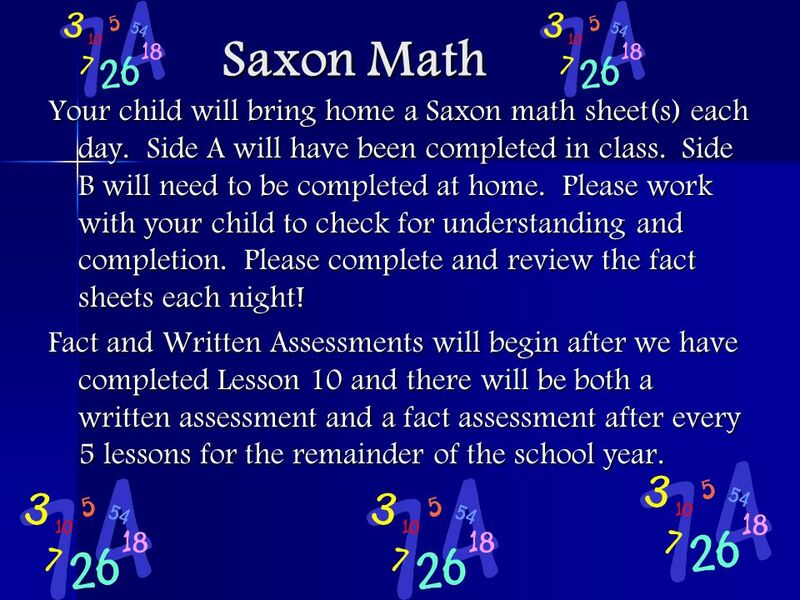 18 Saxon Math Saxon Math Your child will bring home a Saxon math sheet(s) each day. Side A will have been completed in class. Side B will need to be completed at home. Please work with your child to check for understanding and completion. Please complete and review the fact sheets each night! 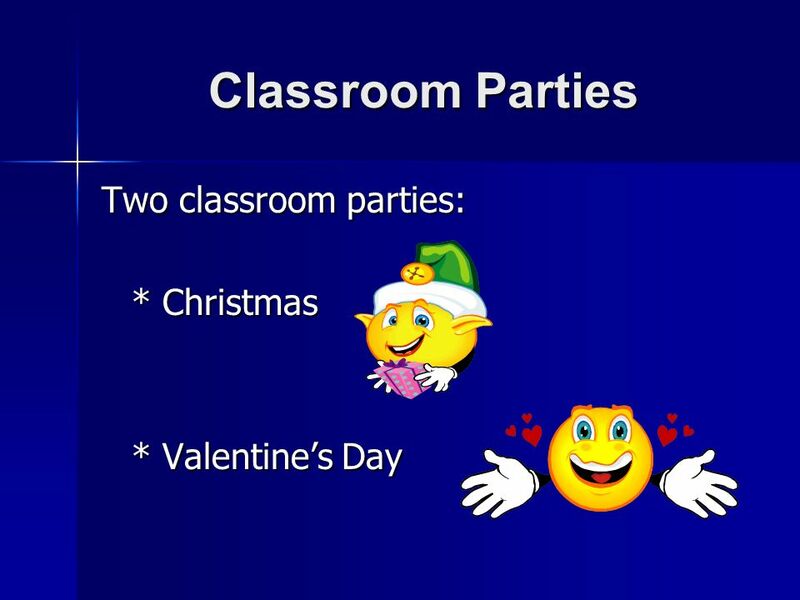 Fact and Written Assessments will begin after we have completed Lesson 10 and there will be both a written assessment and a fact assessment after every 5 lessons for the remainder of the school year. 19 Science 4 AMSTI modules that promote hands-on experiments. 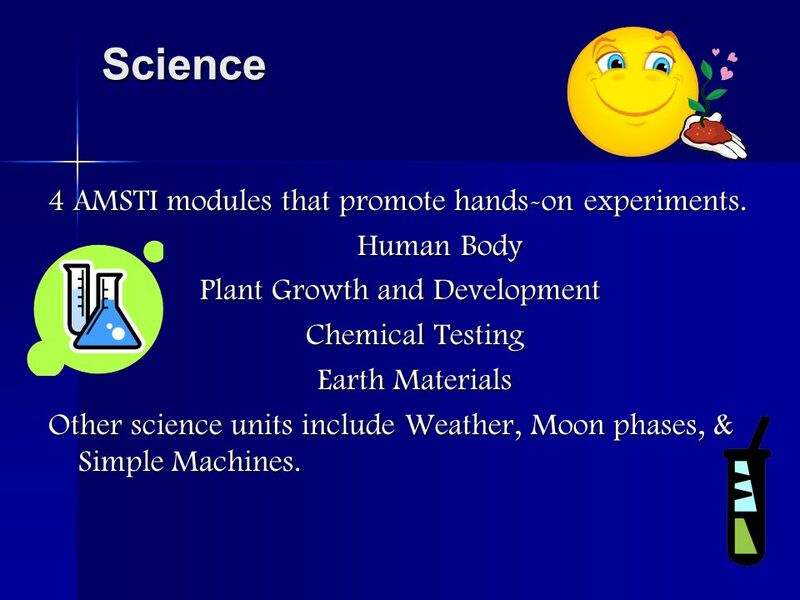 Human Body Human Body Plant Growth and Development Chemical Testing Earth Materials Other science units include Weather, Moon phases, & Simple Machines. 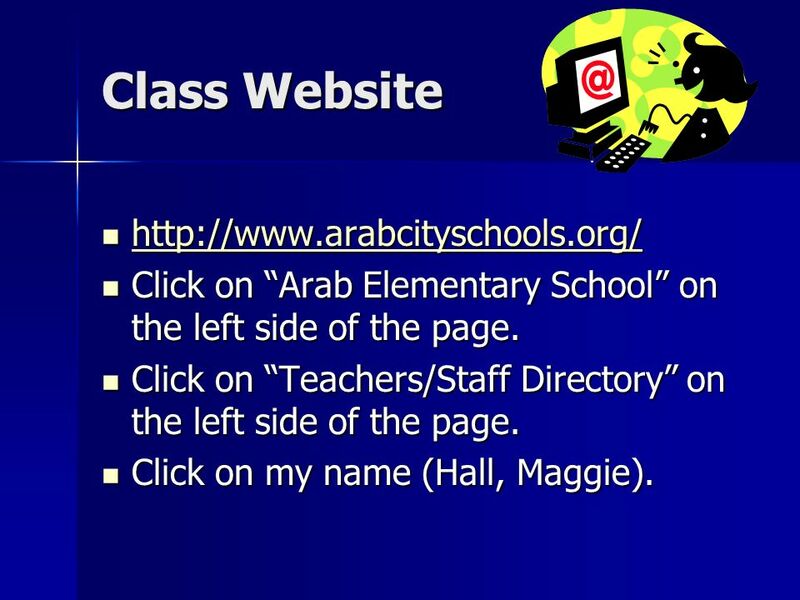 21 Class Website http://www.arabcityschools.org/ http://www.arabcityschools.org/ http://www.arabcityschools.org/ Click on Arab Elementary School on the left side of the page. 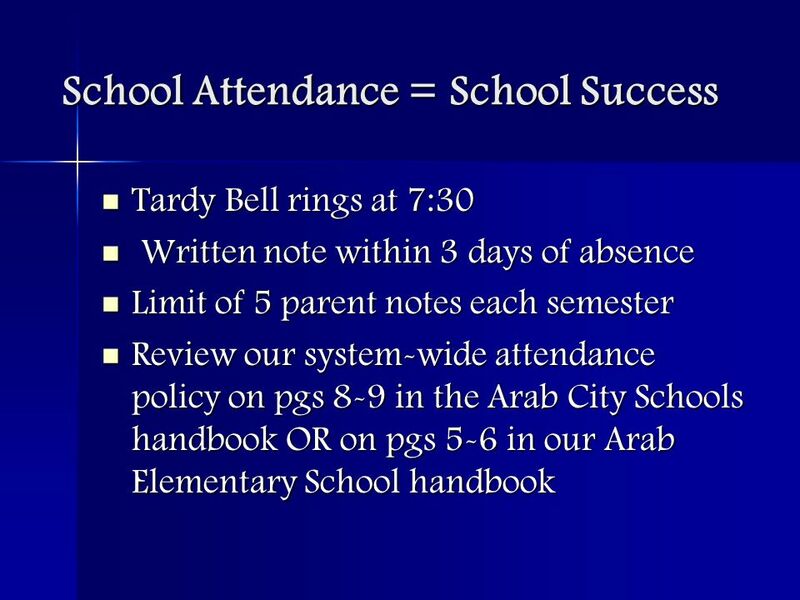 Click on Arab Elementary School on the left side of the page. 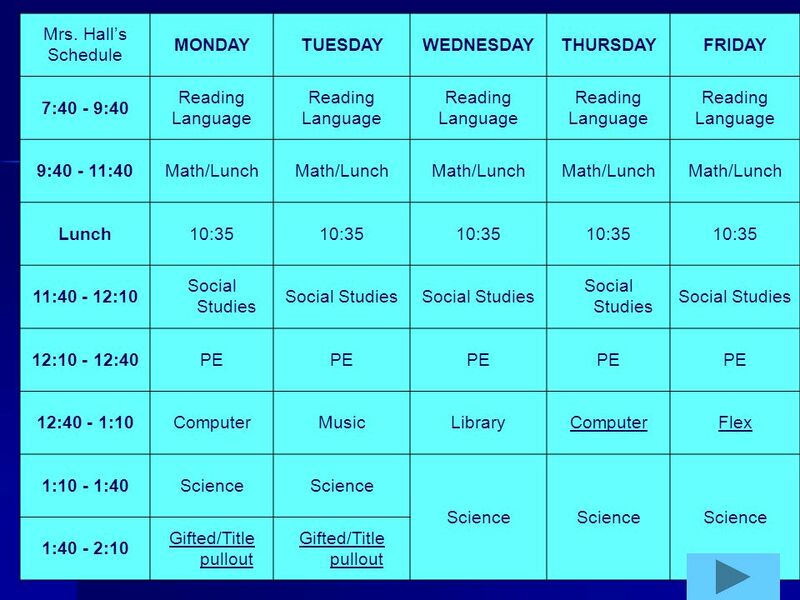 Click on Teachers/Staff Directory on the left side of the page. 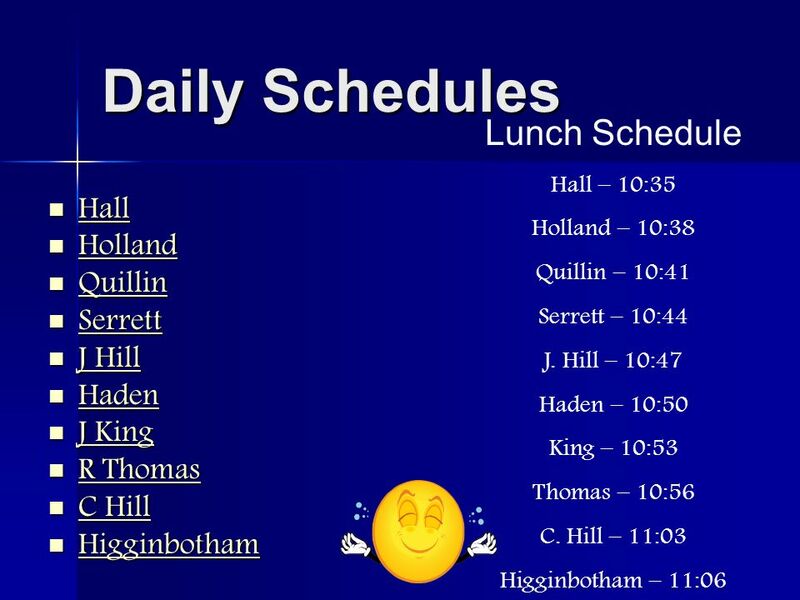 Click on Teachers/Staff Directory on the left side of the page. Click on my name (Hall, Maggie). Click on my name (Hall, Maggie). 22 Thank You For Coming We are going to have a wonderful school year! 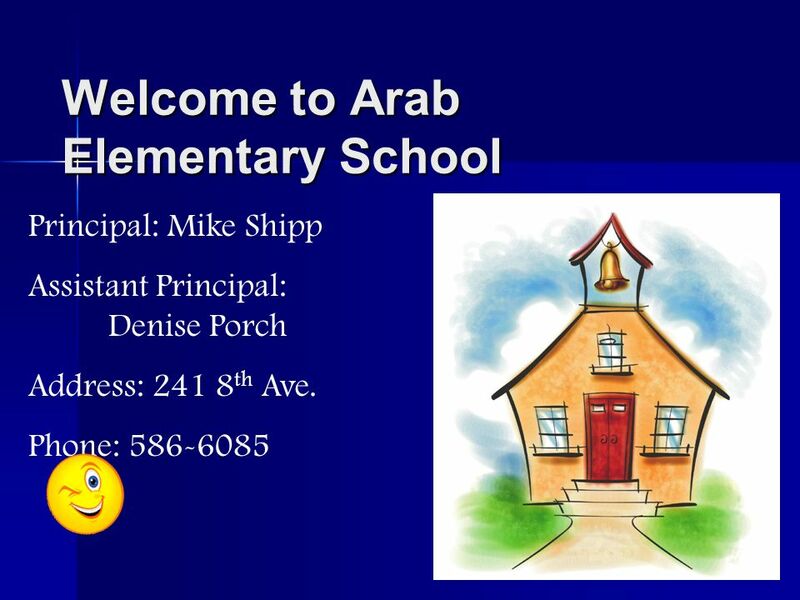 Download ppt "Welcome to Arab Elementary School Principal: Mike Shipp Assistant Principal: Denise Porch Address: 241 8 th Ave. Phone: 586-6085." Welcome to Second Grade. Agenda Comes home each night Needs to be signed Use as a communication tool Look for assignments and notes. 5 th Grade Awesome Teachers Christie Sovie, Libby Romig, Tricia Evans, Lynn Bump, Dianne Meyer. Welcome to Open House Anthony Schifano Pine Tree Elementary School. 1. I will be respectful of others and not disrupt classroom learning time. 2. I will raise my hand to ask or answer a question and always use complete. Mrs. Brown’s 3rd Grade Class. Welcome & Introduction Welcome to Parent Orientation About Me –Family –Interests and Hobbies. Mrs. Arkinstall First Grade WELCOME! A little bit about me… * This will be my 12 th year in the school district * 11 years experience in WSD, 4 here. Welcome to Mrs. Kohrmann’s 4 th Grade Class nves.tvusd.k12.ca.us. Welcome To Mr. Olson's Class 4th Grade. 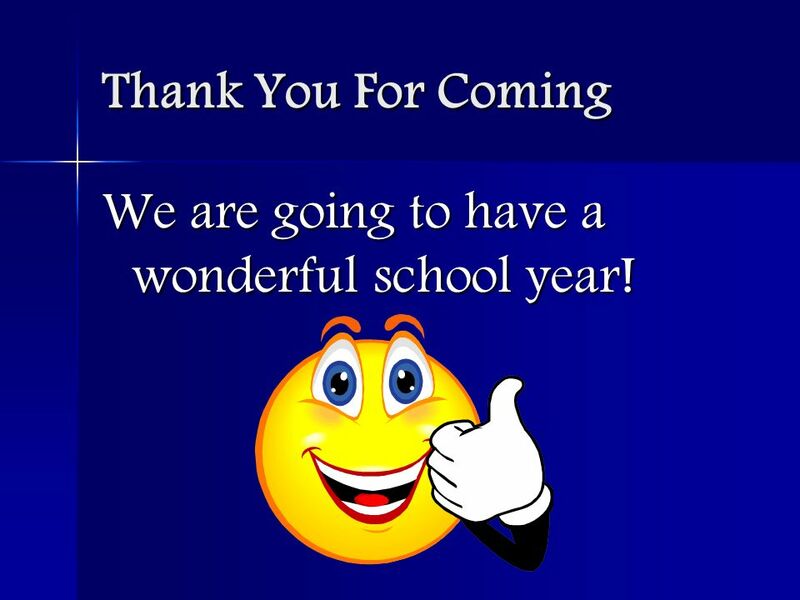 W ELCOME TO T HIRD G RADE S OUTHSIDE E LEMENTARY S CHOOL School Year 2013 - 2014.